Consultancy: Sun International is provides gulf jobs for better future. We do extensive search and bring you best jobs from the gulf countries. We always provide genuine , 100% real jobs. 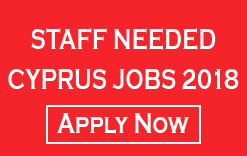 Below are the vacant positions currently in CYPRUS. Don’t Miss this opportunity. Location: – CYPRUS, The Republic of Cyprus occupies the southern part of the island of Cyprus in the eastern Mediterranean. The island (and capital city Nicosia) is divided with Turkey to the north. Known for beaches, it also has a rugged interior with wine regions. Coastal Paphos is famed for its archaeological sites relating to the cult of Aphrodite, including ruins of palaces, tombs and mosaic-tiled villas. Salary:Excellent Salary provided: Basic Salary: $1500 – $2000 After one year increase salary.